How absolutely lovely, Misty! 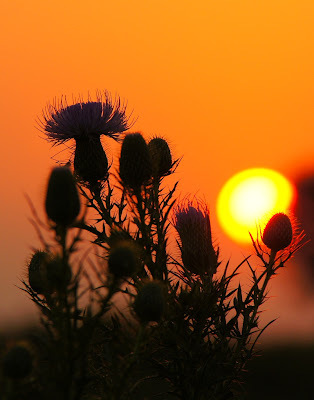 I love thistles (Scottish ancestry) and I seldom see sunrises, so this is a gift. I love the thistles silhouetted against the sun like that! Still so obviously thistles, but you have to focus on the shape, rather than the colours! I was out on Saturday taking photos of thistle but the bright sunlight is no match for that gorgeous sunrise. That is a great shot. This is one of a kind inspirational photo that I really wanna see everytime the sun sets. I so love this shot, great work for the capturing the perfect angle. Love this photo... especially the hints of purple you can see in the silhouette. Wow - what a glorious shot!